It's been a while since I've done an "Inspired By" post here on the blog... So whattya say we get our creative juices flowing by checking in with an amazing lady who makes some seriously rocking' (some not to mention really, really pretty) textiles? The lady in question is one Christina Lynch. Witty, mannered, and seriously cool, the Dallas native has channeled her deep love for her mother's home country of Mexico into Mi Golondrina, her line of exquisitely embroidered bedding and lounge clothing. 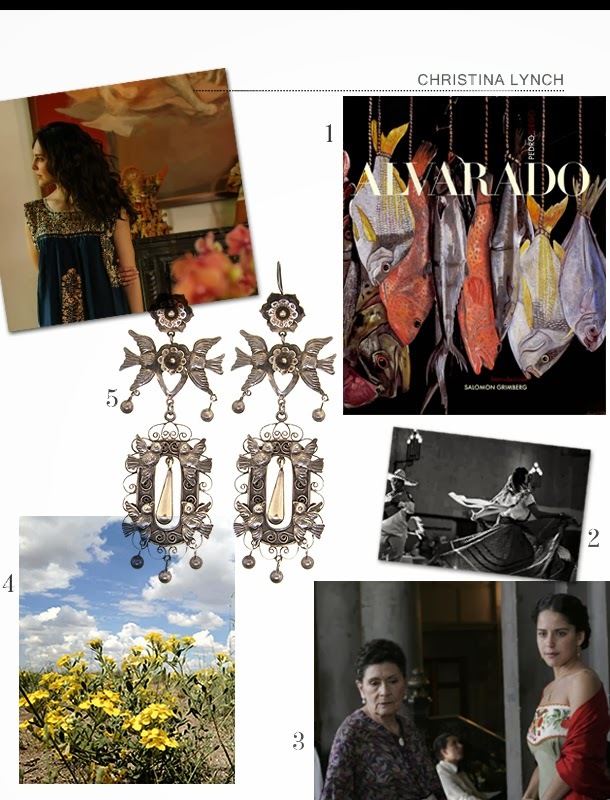 The production of each Mi Golondrina item begins in the small villages of Mexico by the hands of creative and powerful women representing four generations of skilled craftsmanship. Each village in Mexico has its own traditions and stories. Mi Golondrina intends to continue to share the stories of Mexico while marketing these products and keeping the women in these villages working and proud. So with out further ado, herewith Christina Lynch's inspirations. 1. Mexican Painters -- My parents have been collecting Mexican art since I can remember and it has been such an incredible thing to be surrounded by. They collect in many different mediums, but I find myself staring at the paintings by two of my favorite artists, Pedro Diego Alvarado and Juan Torres. The both of them use very rich colors. I had the opportunity to see Pedro Diego Alvarado's house when I was in Mexico City and first beginning Mi Golondrina. The house was just as inspiring as his paintings. 2. Traditional Clothing -- One of my favorite things when I travel is to observe the dress of that country. I think that is why I love Oaxaca so much. The women wear the most beautiful dresses. Each region has it's own style and I have been lucky to witness dances and celebrations of these styles. 3. Film -- I love going to the movies by myself and soaking up all of the details. It's one of my favorite activities. One of my favorite films is Arrancame La Vida. The story takes place in the 1930s in Mexico and the scenes are stunning. 4. Flowers -- I try to always have flowers around me. They keep me happy and I think they also inspire me to see colors differently. I enjoy making flower arrangements and putting unexpected colors together. 5. My Mother -- She had her own clothing line before I was born and is the most creative and driven person I know. She was born in Mexico and her fashion reflects it. I share her passion and because of that her style has evolved into mine. I am always borrowing her things. She has beautiful Oaxcan earrings and long full Mexican beaded skirts. The romance in her style is what I admire most. Christina's aunt, her mother's sister, is Jan Barboglio and is also a well known creative entrepreneur. I'm sure you've run across her metal decorative items at Neiman Marcus and Forty Five Ten. Yes, Jan is amazing. Christine for sure has the creative genes! !